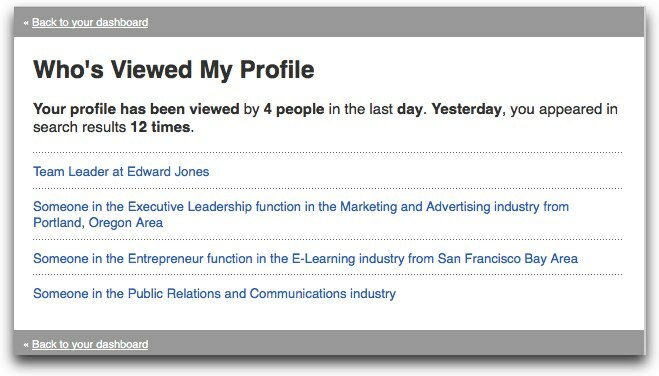 LinkedIn Recruiter Tip: Who's Read My InMail? During training sessions LinkedIn Recruiter, I am often asked if it's possible to tell if an InMail message has been read. Technically, I have to say no, but with a little detective work, you might be able to figure it out using the Who's Viewed My Profile (WVMP) feature built right into your LinkedIn Recruiter Dashboard. This feature shows you how many people have been viewing your profile over a random number of days. It also shows how many times your name has appeared in search results. Now let's put on our detective caps and learn how WVMP can help solve the mystery of WRMI (Who's Read My InMail). Some of the people listed under WVMP may have found you through other means (Search, Company Page, Groups, etc), but a few of them found you because you sent them an InMail and they clicked through to your profile to learn more about you. Compare this list to the messages in your Sent Items, and you'll soon learn WRMI. For participating members who have chosen not to share their full names, you'll see anonymous data about them. But if you see that "A director in the Hospital & Health Care industry in the Seattle Area" looked at your profile, and you know you sent an InMail to "A director in the Hospital & Health Care industry in the Seattle Area" - then chances are that person read your message before clicking through to your profile. Mystery solved? Well, it's not a perfect solution, and it doesn't work 100% of the time, but it's a good indicator of the quality of your InMail messages. If a lot of people are clicking though to your profile you're doing something right. If not, you might want to retool your message template. More on that later.